Ticket To Ride is rightfully considered a classic board game. Released just ten years ago, it's sold over two million copies (and, more importantly, shows up regularly on shelves at big box retailers) and is destined to stay around for the long term. From publisher Days of Wonder, let's take a look at it. 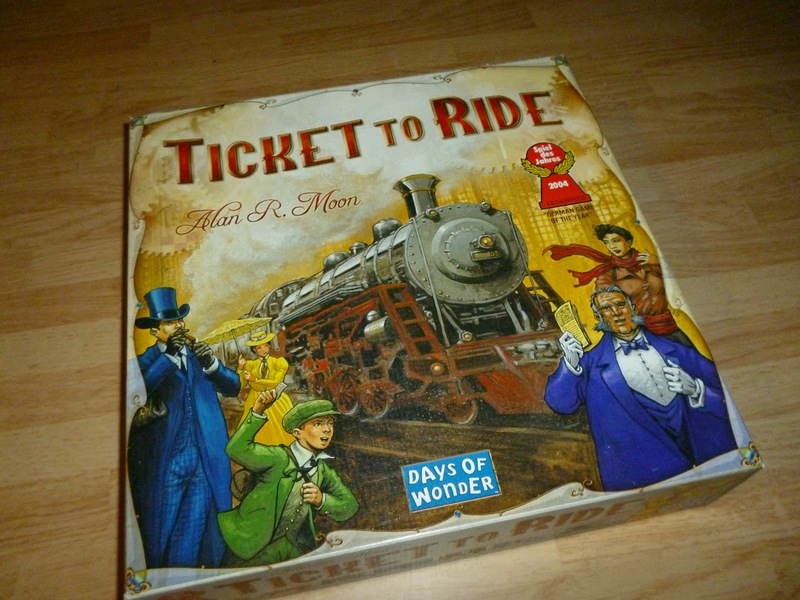 In Ticket to Ride, players are trying to earn the most points. They do so in two ways: by laying down train track between different cities, and fulfilling "routes" depicted on cards. 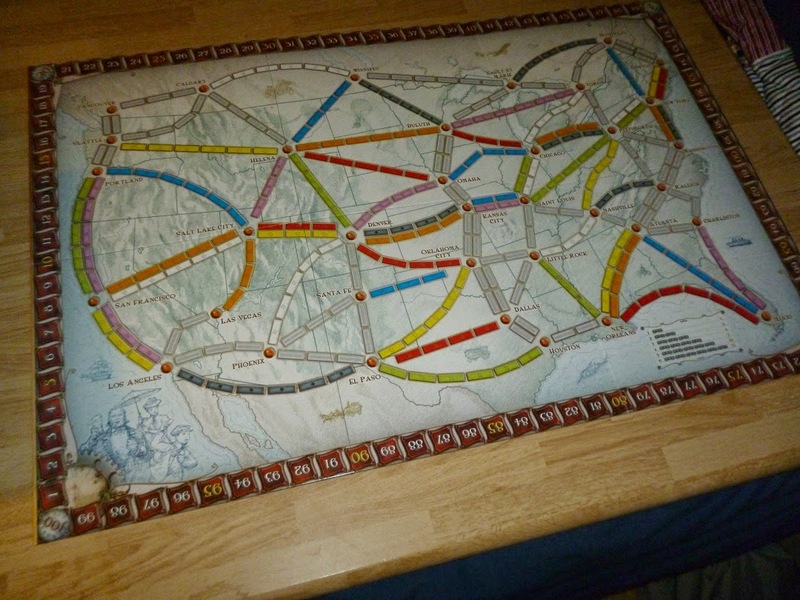 The route cards are by far the more lucrative way of winning points but can be very difficult to pull off. The basic game is a map of the United States and Canada. 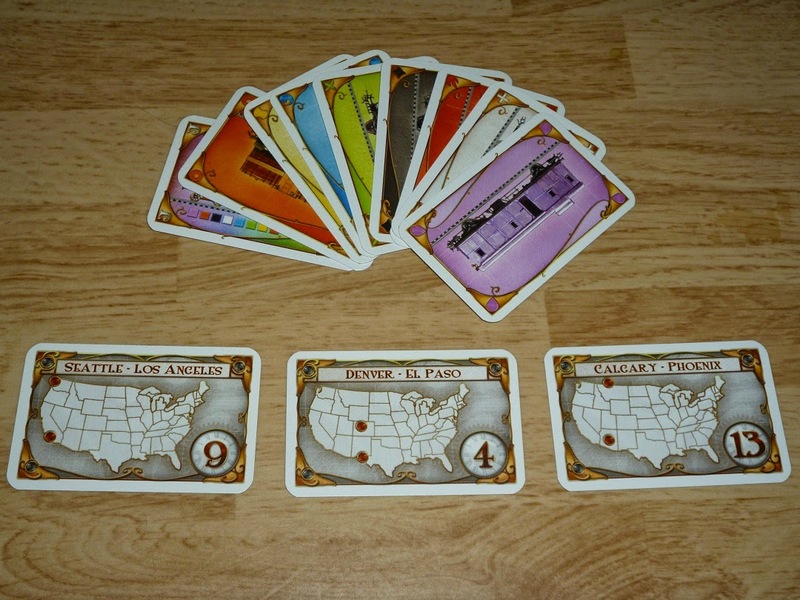 Each turn, a player may do one of three things: draw train cards, draw ticket cards, or build track. If you choose to draw a ticket card, you draw three of them, and may choose one, two or all of them to take. (You have to choose at least one.) There's no limit to how many train or ticket cards you can have in your hand. Train cards above (the wild card is on the left); ticket cards below. Finally, you can build track. In order to build track, you must have the appropriate color of trains in your hand. For example, looking at the map above, if you wanted to build a track between New Orleans and Miami, you would have to discard six red train cards. 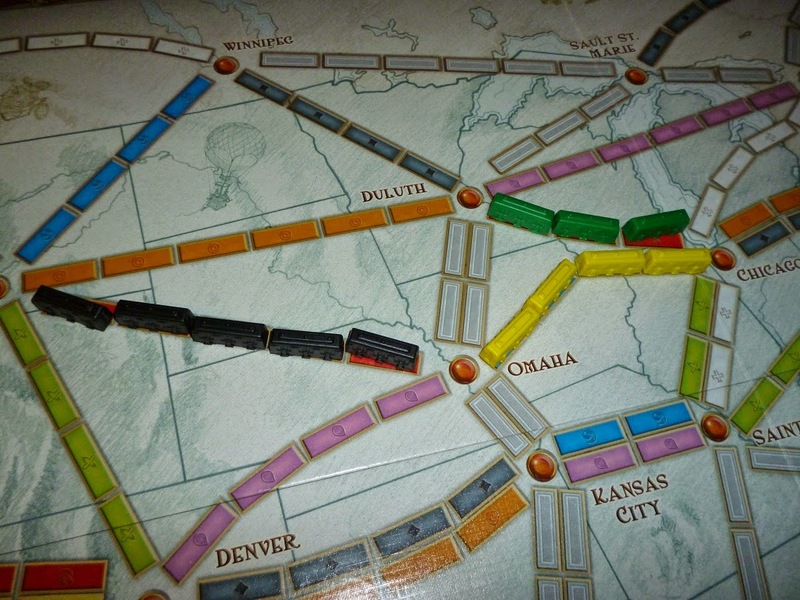 Gray routes on the board can be fulfilled with any color of trains, although they have to all be the same color. (For example, if you wanted to build between Phoenix and El Paso, you could play three green cards or three red cards or whatever--three cards of any similar color.) Wild cards, of course, can stand in for any color. Each time you build any track you score a small number of points. At the end of the game, any ticket cards you have fulfilled gain you the number listed on the card; you fulfill it by having uninterrupted track from one city to the other. If you fail to do this, you lose the number of points on the card! There's also a bonus for the longest track on the board. Highest scoring player wins! It's simple and yet relatively deep. There's strategy involved of when to draw cards and when to start building routes, because once you start building there's a race to see who can reach what city first...and then players pull back as they reassess their holdings. The game is basically rummy, only when you make melds instead of just putting it on the table you convert it to a train track. There are plenty of good, solid choices. Do you go for a series of small routes, or do you try for a few big ones? Do you keep drawing cards so you can cover any contingencies, or do you start connecting cities before your rivals do? When do you start drawing new ticket cards, and when it is too late to do so before getting caught with a bunch of unfinished routes that are going to penalize you? While these decisions are plentiful, they're simple enough that most players can grasp them pretty quick. Game play is fast. You can only do a limited number of things on your turn, and two of the three can be done in a few seconds. Only when it's time to lay track is there a little work involved. It keeps players engaged almost the whole time, whether it's their turn or not. There's a strategy called "blocking," which is exactly what you think it is: If you see a player trying to connect a route from one city to another, you can simply build a section of track to block them off. In theory, it's a nice concept. In practice, however, it can cause a lot of frustration, because the cost of blocking is incredibly cheap and the cost to fix it is very expensive. Someone can spend two trains to force another player to spend twelve trains. Thankfully, the map is robust enough that there's enough safety valves to prevent this from happening too much, but still, it can sometimes cause issues. The coloring of the map is off. It's weird having both a yellow player and yellow track on the board. I understand there's only so many colors they can use, but it can still confuse new players. In the end, Ticket To Ride has sold all those copies for a reason. It's a simple game--especially if you are familiar with rummy, since this game is simply rummy with extra rules. It's a common and exciting theme that a lot of people are familiar with. It's one of the most common gateway games used to introduce new players into the hobby and it's hard to argue with it's longevity. I grade it an A. From Chutes and Ladders to Stratego, Risk, and Battleship, board games are just plain fun. We could play best board games all summer long in the floor. You Won't BELIEVE This Post! Hi Ho! I'm A Jerk!